Crocodile Dundee II catches up with Mick Dundee (Paul Hogan) and his American girlfriend Sue Charlton (Linda Kozlowski) some time after the end of Crocodile Dundee. Mick Dundee is now living with Charlton in New York, but finding himself without much to do, except fish in the harbour with dynamite and watch the daytime soaps. So, at Charlton's suggestion, he gets a job delivering office supplies for his friend Leroy (Charles S. Dutton). Meanwhile, Charlton's ex-husband Bob (Dennis Boutsikaris) has fallen foul of South American drug lord Rico (Hechter Ubarry), who kills him for photographing a murder. But before his death, Bob had time to send the evidence that will convict Rico on to Charlton in New York. When Rico finds out, it makes Charlton his next target, and he and his henchmen head to New York where they kidnap her to force her to give up the evidence. Luckily, Dundee is on hand to rescue her, with the help of a street gang he recruits to provide a diversion. Discouraged by the difficulties of protecting her in the city, Dundee takes Charlton back to the place he knows best, his home town of Walkabout Creek in Australia's Northern Territory. There he can make use of his wits, his local knowledge and his mates to get the better of the bad guys in a final showdown. Crocodile Dundee was the surprise box office smash of 1986, making more than $300 million worldwide and tickling the fancy of American audiences more than almost any other film that year. So there was always going to be pressure to produce a follow up, especially in the sequel-hungry 1980s. 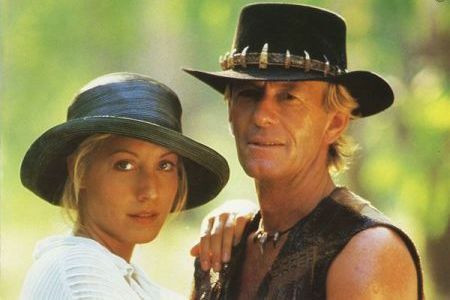 Paul Hogan and his agent John Cornell had raised the financing for Crocodile Dundee from private investors, using an Australian government tax scheme designed to encourage investment in Australian feature films. They then had to sell the film to sceptical distributors (and plenty were not that enthusiastic, especially in the US). But with the extraordinary success of Crocodile Dundee, there was never any doubt about finding financing for a sequel, and this time Hogan and his partners had a distribution deal in place with Paramount Pictures, the US distributor of the first film, and a significantly bigger budget, almost twice that of the original according to some sources. But Crocodile Dundee is a tricky film to write a sequel for, as it's essentially self-contained. A second film can't re-use the premise of the first without simply extending the original film. Mick Dundee has already been introduced to the big city and to America, so where does the story go now? The answer for Crocodile Dundee II is simply to reverse the trajectory of the original. Instead of beginning in Australia, exploring the scenery of the Northern Territory, and then heading for a big city adventure, Crocodile Dundee II begins in New York and then heads for a finish in the environs of Walkabout Creek and the wilds of the Australian bush. The first half or so of Crocodile Dundee II deals with the further misadventures of Mick Dundee in New York, most of which admittedly feel like ideas that were left over from the first film. These include Dundee trying to talk down (or not) a would-be suicide, his shocked reaction to learning that a man could have a boyfriend (hey, it's 1988), and accidentally teaching kids swear words. The New York material is all very self-aware and includes a moment when Dundee swings on a rope through the window of a skyscraper (“Oh, excuse me”), acknowledging the character's Tarzan roots, and various call-backs to the first film. These include a bad guy who compliments Hogan's bush knife with the words “Now that's a knife”, referencing the most famous line from the original. Things pick up a bit when the villains start gunning for Charlton, and Dundee proves that he's now mastered the urban jungle, giving bad guys and police tails the slip, and enlisting Japanese tourists and a local gang to help him get the better of the criminals. There's also an irresistible trailer-friendly scene where Dundee uses his knife-throwing skills to put a punk with a mohawk in his place. The film is back on familiar territory again for the second half, when Dundee takes Charlton back to Australia, where he feels better able to protect her from the bad guys. Here he uses a series of tricks, feints, diversions and some misdirection to foil Rico and his henchmen. The portrait of the bush isn't quite the mostly idyllic one seen in the first film. This time, the darkness and perils are emphasised, with the bush portrayed as a place of danger, black magic and sudden death. Admittedly, much of this is part of Dundee's plan to foil the bad guys, but it's still a noticeable tonal shift in the presentation of the film's Australian locations. There's also a scene where Dundee uses a bullroarer, a traditional musical instrument, to contact local Aborigines, with the weird sound of the whirring bullroarer matching the eerie isolation of the location. The scene reasserts Dundee's semi-Aboriginal nature as well as the other-worldly quality of the landscape. The film itself undergoes a noticeable genre change, developing from the first film's culture clash comedy into more of an adventure film with comic elements. There's also more death and danger in the story this time, which threatens to make this a darker affair than the original, but the lightness of touch is generally maintained throughout and the change in genres from comedy with moderate peril to wilderness adventure with humour, is not as jarring as it could be. This is partly because the film never takes itself or its premise too seriously, and partly because Dundee always was an adventure film character at heart. Admittedly, he does become almost too good to be true at times and the idea of a good natured larrikin who tells tall tales is left behind as the writers come to believe Dundee really is an Indiana Jones style hero. In the Australian scenes, the villains are mostly reduced to being foils for Dundee's tricks and exploits and Charlton's role becomes a straightforward damsel in distress. The subject matter also makes the film seem even more of its time than the original, because if there's one thing that's more typically 1980s than films with numbers after the title, it's films where the bad guys are South American drugs barons. There's inevitably a sense of deja vu with Crocodile Dundee II and the script isn't as sure-footed as the first film's. It does continue to explore some of the themes of the original, in particular the value of building alliances across national, cultural and racial divides, and the subverting of stereotypes. These include the stationery delivery guy, Leroy Brown, who's stuck with a bad dude image due to the Jim Croce song “Bad, Bad Leroy Brown”, and Aborigines who exploit misconceptions about cannibalistic savages to frighten the criminals. The film also elaborates on the original's themes of Australian masculinity and national identity, although perhaps in a less obvious way than in the first film. Crocodile Dundee II begins with Dundee in New York, partly (although not quite) tamed by the big city and by domesticity. Charlton suggests he finds a job, while he spends his days at home watching soap operas, traditionally a female pastime. When the villains appear it gives Dundee a new opportunity to utilise his skills, which otherwise don't seem to have much value in the city. While Charlton is the breadwinner and Dundee effectively a stay-at-home husband in New York, back in Australia the positions are reversed and Charlton is again reliant on Dundee. While Dundee can now navigate the big city, the film suggests that he is a slightly diminished figure in this environment. To be the semi-mythical character that the film builds him into requires him to go back home to Australia. The film's narrative arc reasserts Dundee's masculinity and his Australian identity. As well as Paul Hogan and Linda Kozlowski, the film also sees the return of John Meillon as Dundee's hapless business partner Walter. Meillon gets a significantly bigger role and more comic business than in the first film, which is definitely a good thing. 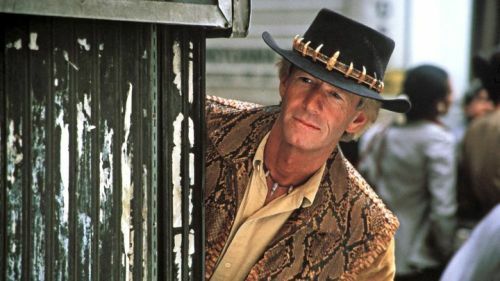 Meillon had worked in mostly British and Australian film and TV for 30 years, but the Crocodile Dundee films provided him with probably his best known role, and Crocodile Dundee II was his final film before his death in 1989. Several other inhabitants of Walkabout Creek return for the sequel, including wrestler Steve Rackman (as Donk), Maggie Blinco (Ida) and Gerry Skilton (Nugget). The film also reunited much of the team behind the camera from the first film, including editor David Stiven, composer Peter Best and cinematographer Russell Boyd. 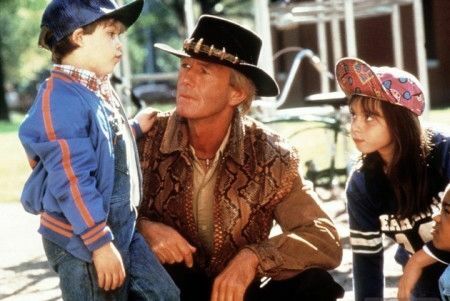 Hogan wrote the screenplay with his son Brett (who had an acting role as one of the kangaroo hunters in Crocodile Dundee) and the film was directed and co-produced by John Cornell, the producer and co-writer of the first film. Although the plotting of Crocodile Dundee II is not especially plausible, it was probably a smart move to shift the storyline into action-adventure film territory. The narrative of Crocodile Dundee had no obvious way of being developed and a sequel that simply extended the story of the first film almost certainly wouldn't have worked. The critical reaction to Crocodile Dundee II was decidedly mixed, but the film mostly repeated the success of its predecessor, with worldwide box office of around $240 million, compared to $328 million for the first film. Hogan would retire the Mick Dundee character until a belated second sequel, Crocodile Dundee in Los Angeles, in 2001. Testing and hoping that this comment works! A very good sequel. I love the first film so much, but I do think this one is almost as good as the first one is. The other film in the series is dire. Mick is such a loveable and badass dude, I never get tired of watching either of these films. Such great fun. Hey it works, you're no longer anonymous! I think Croc 1 and 2 are both a bit underrated, they seem to have fallen out of fashion (although not with British TV schedulers it seems, Croc 2 was on again tonight!). I agree that this is a pretty good sequel, much better than is often made out. I've seen some complaints about the pacing and it's true that this one takes its time, but I think the unhurried style of these films is part of their character.